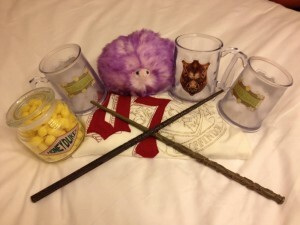 The Wizarding World of Harry Potter merchandise available throughout Universal Orlando Resort is some of the most exciting and desirable stuff you can purchase with your vacation dollar. 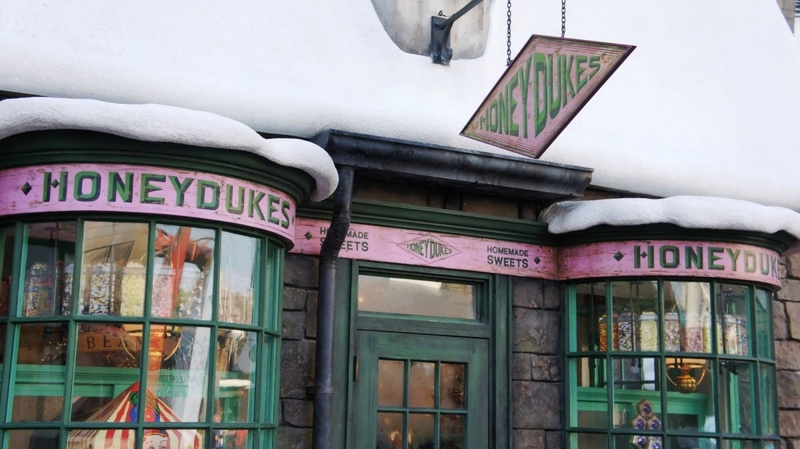 On this page, we will take an in-depth look at what’s available, where you can buy it, and how much it costs, with a special focus on Hogsmeade. And you don’t want to miss our photo gallery at the bottom of the page, which features 55 full-screen images. Please note that our prices are rounded to the nearest dollar and do not include sales tax. 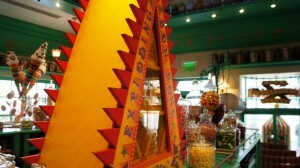 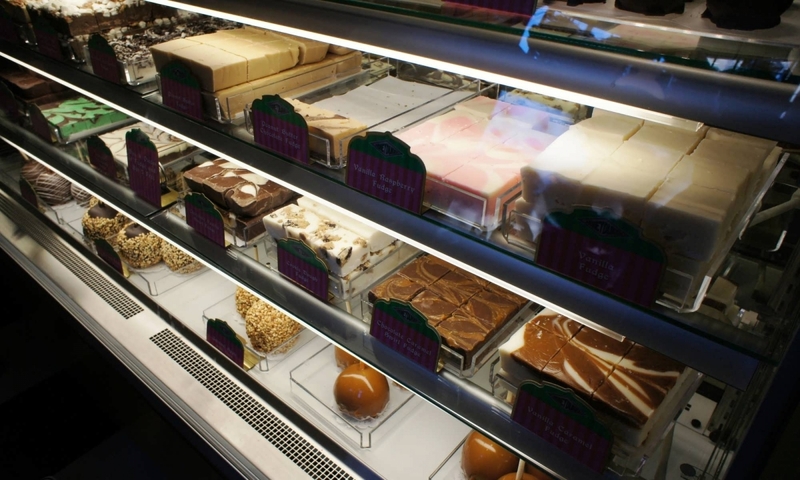 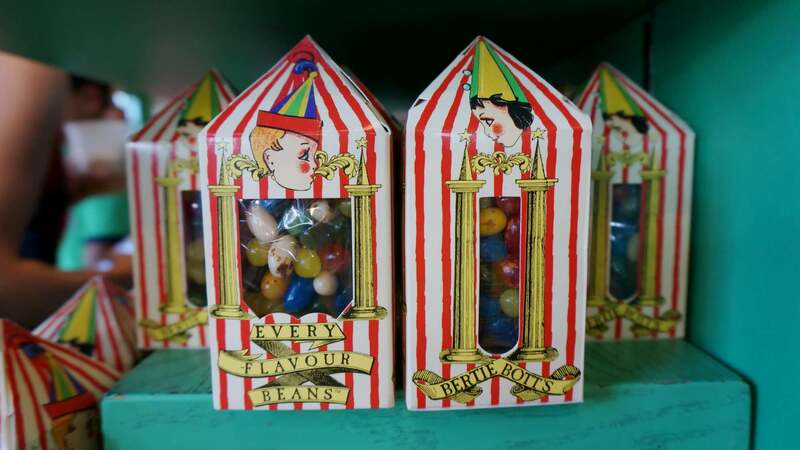 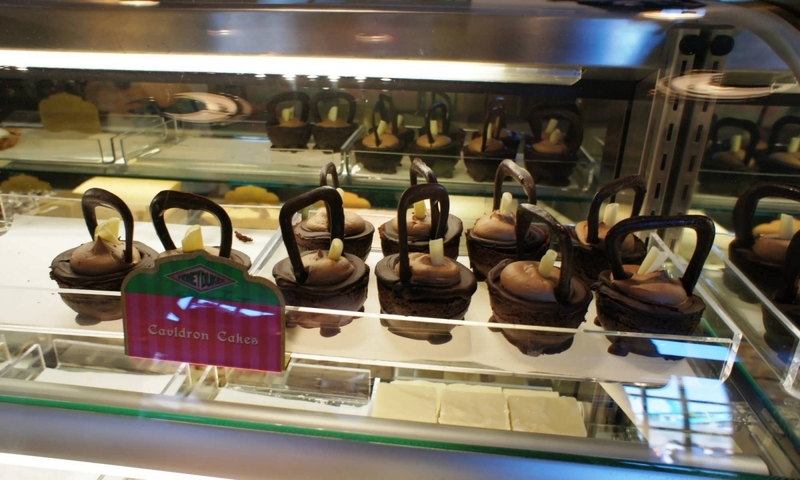 This sweet shop inside The Wizarding World of Harry Potter – Hogsmeade is full of unique, tasty items familiar to any Harry Potter fan. 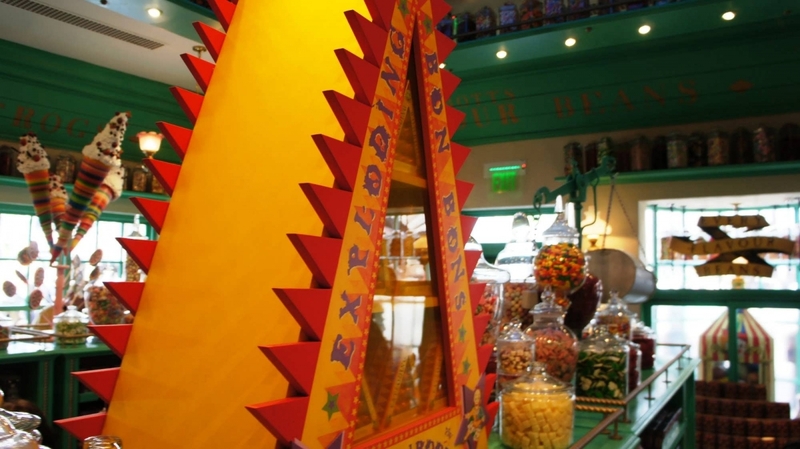 Candy from the books and films to be found here include Chocolate Frogs (with the collectible trading cards inside), Lemon Drops (Dumbledore’s favorite), Bertie Bott’s Every-Flavor Beans, Chocolate Wands, Fudge Flies, Peppermint Toads, a variety of pops (Sugar Quill, Acid, Blood, Candy Frog, and Big Swirl), Chocoballs, Candy Floss, various Binned Sweets in a bag, Exploding Bonbons, Fizzing Whizzbees, Salt Water Taffy, Pink Coconut Ice, Candied Skulls, Chocolate Cauldrons, Pepper Imps, Tongue Burner mints in a tin, Pumpkin Juice, and Ton-Tongue Toffee. 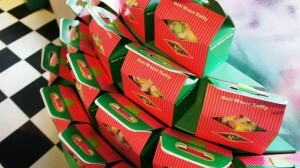 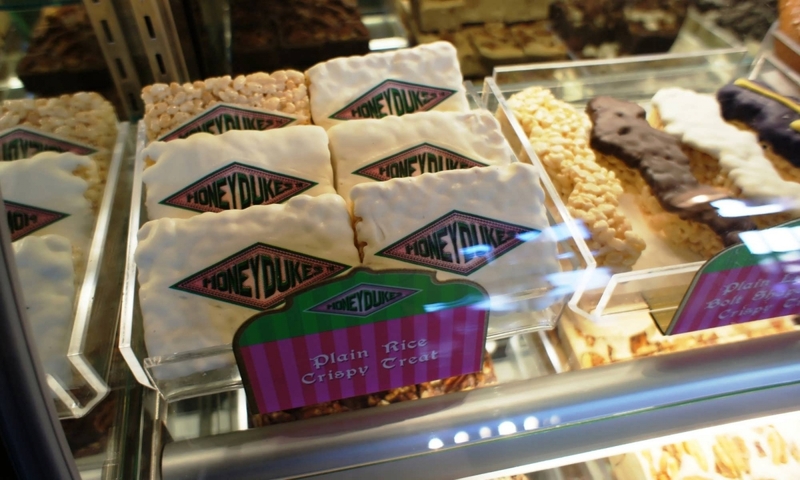 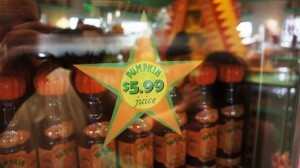 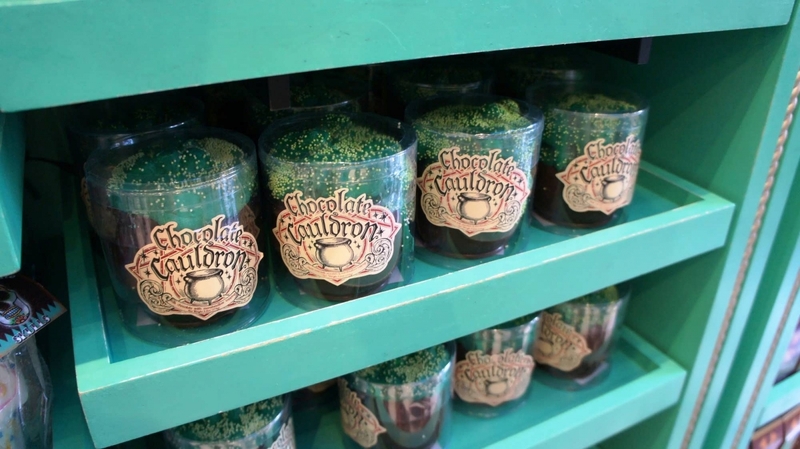 Expect to spend between $4 and $20 for the edible merchandise in Honeydukes. 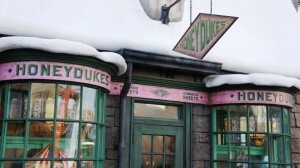 These two shops are combined into one category because they share the same building (along with Ollivander’s Wand Shop). 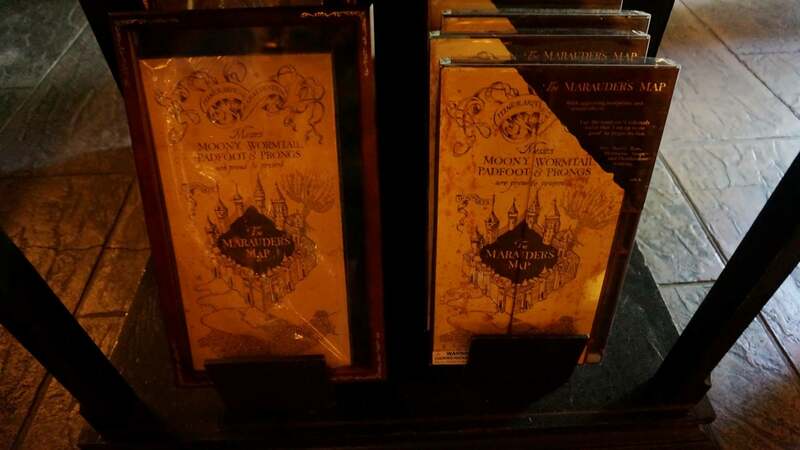 Inside these walls, you will find approximately 17 different character collectible wands, along with a selection of about 13 non-character wands, that each cost $44. 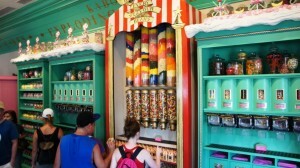 Interactive wands are available here, too, for $50. 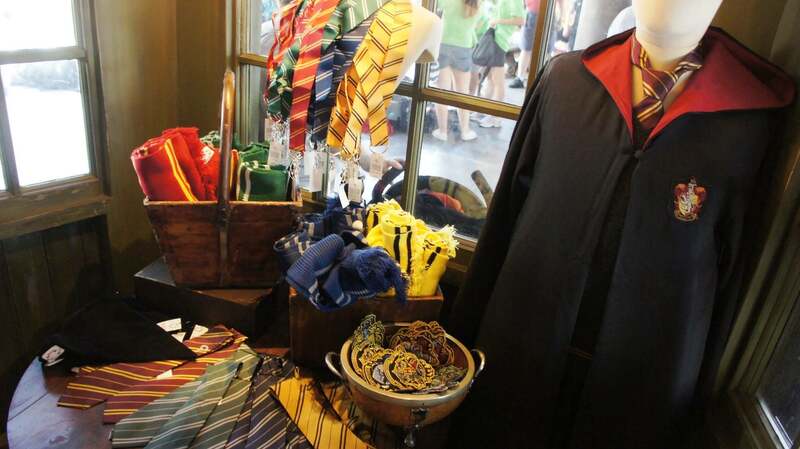 But there’s more to Dervish and Banges than just wands; it also offers Hogwarts’s house-related items, like robes in sizes from XXS to XL ($115), scarves ($39), t-shirts ($22 to $32), sweatshirts ($60), ties ($32), and pillows ($29). 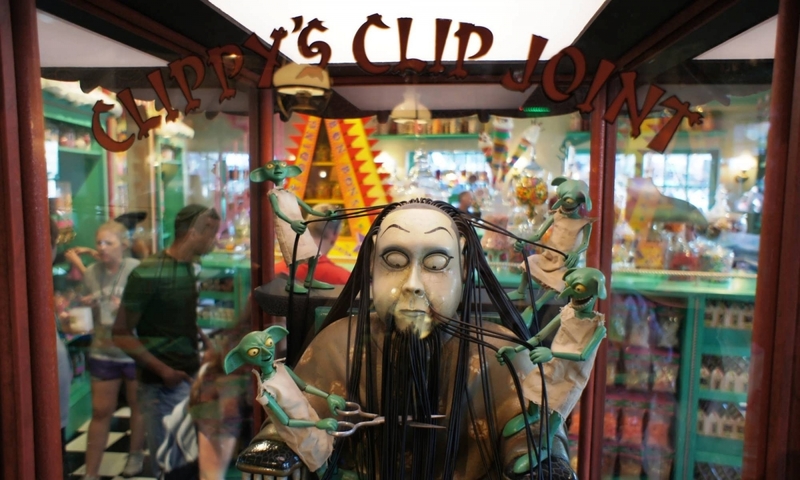 You can also find a battery-operated Monster Book of Monsters for $35. 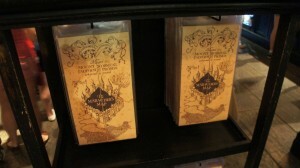 Lastly, there are stationery items available, such as quills ($40) and Hogwarts’s house journals ($17). 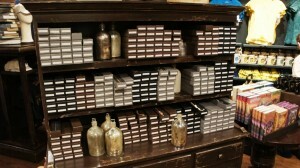 What about Ollivander’s Wand Shop? 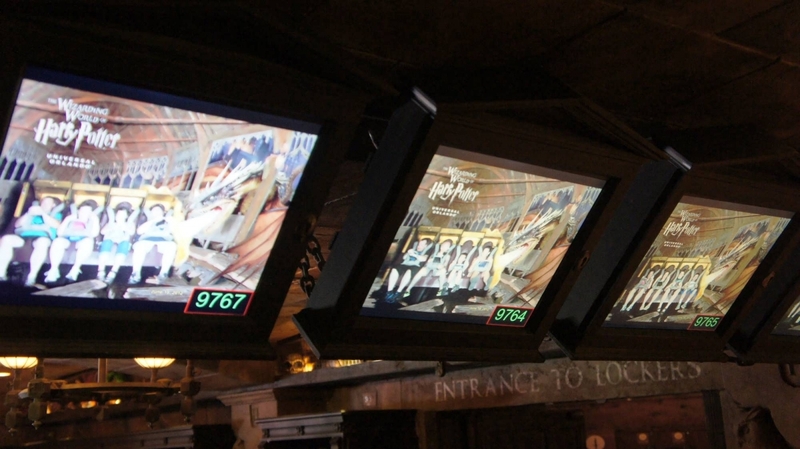 Ollivander’s Wand Shop in Hogsmeade is home to an interactive wand experience. Although it has the theming of a shop, you cannot actually purchase anything here. 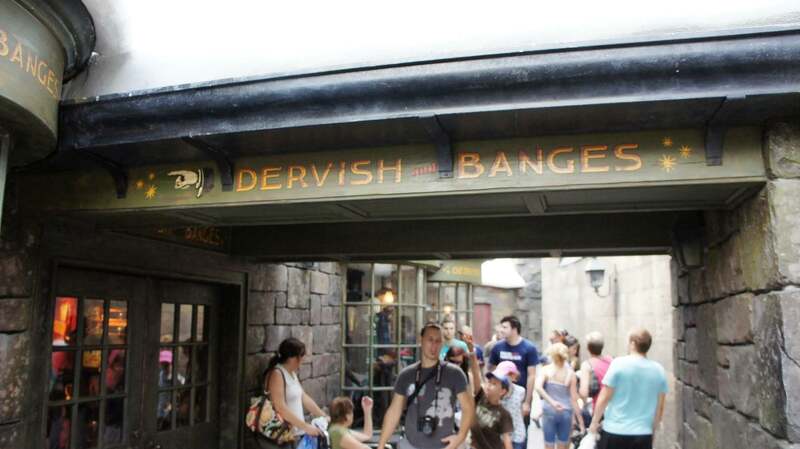 (Instead, wands are sold at the adjacent Dervish and Banges – even those which have chosen a wizard.) Visit our Ollivander’s in Hogsmeade page to learn more. 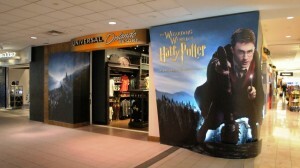 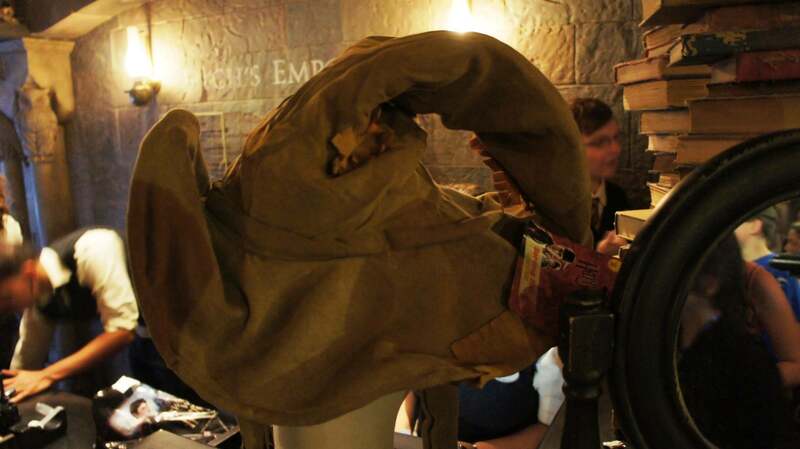 In this store, which also serves as the exit to Harry Potter and the Forbidden Journey, you will find some of the “darker” items and more unique t-shirts related to the Harry Potter series. 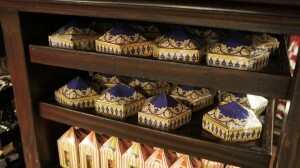 Specialty hats, like The Sorting Hat and Dumbledore’s Hat, are $30, and other caps are $25. 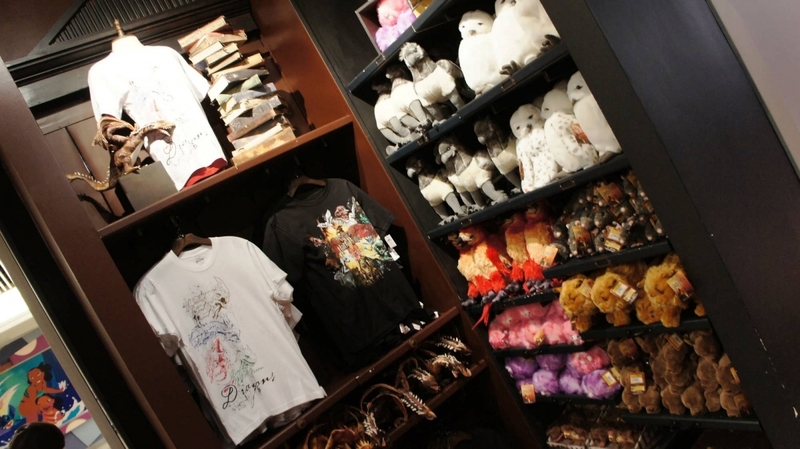 Toys and puppets – including the Weasleys’ car, Omnioculars, and Hedwig hand puppet – range from $17 to $35. 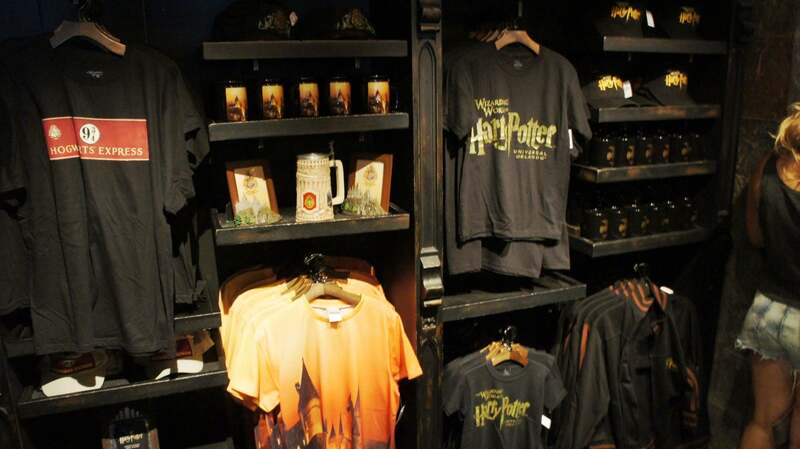 Various mugs touting the Ministry of Magic, Azkaban, Hedwig, and the Tri-wizard tournament range from $13 to $28. 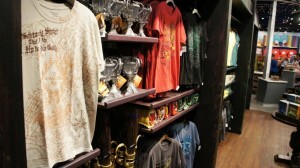 Hogwarts houses, muggle, wizard, Ministry of Magic, and Fluffy t-shirts can be found for $22 to $32. You can also find a Harry Potter chess set for $60 and a Golden Snitch for $19. 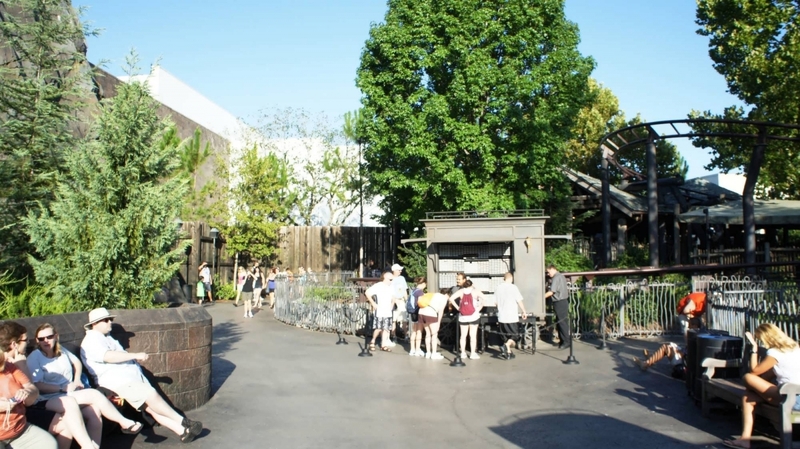 Because getting into the souvenir shops at Hogsmeade can be a bit difficult, several outdoor merchandise kiosks were added. 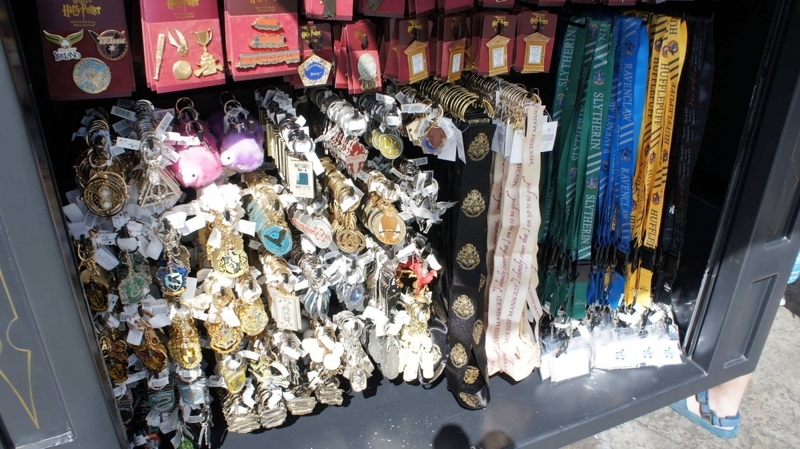 These offer various items, including wands ($44), key chains ($10 and up), collector pins ($8 and up), and lanyards ($11). 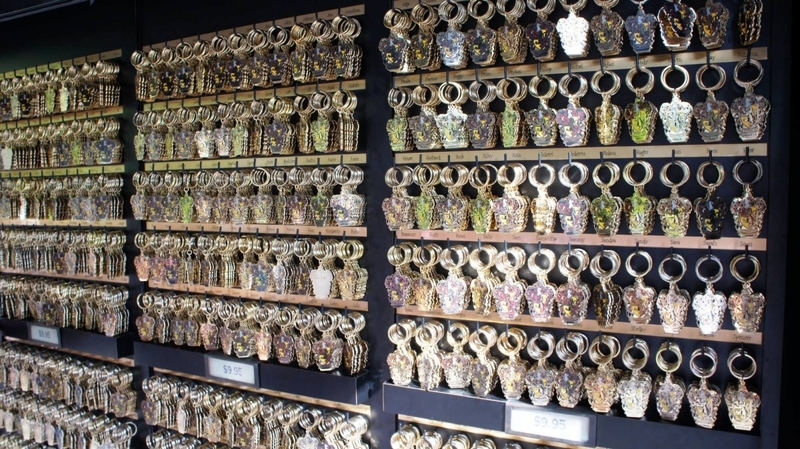 With so many souvenir choices available at Hogsmeade, it can be tough to know where to start. 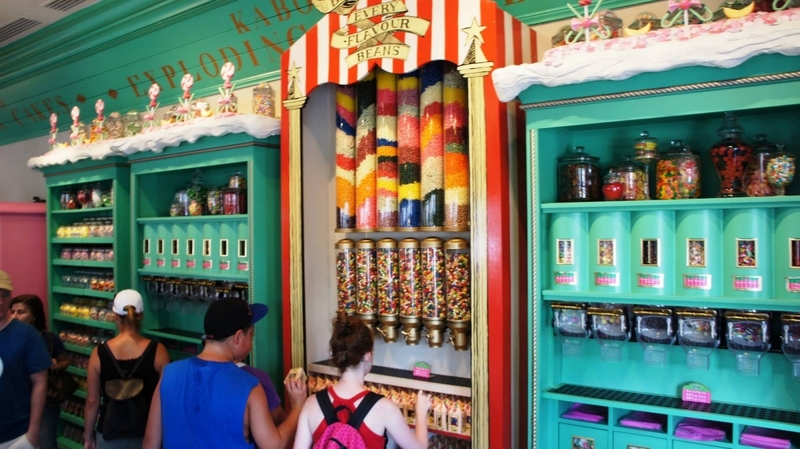 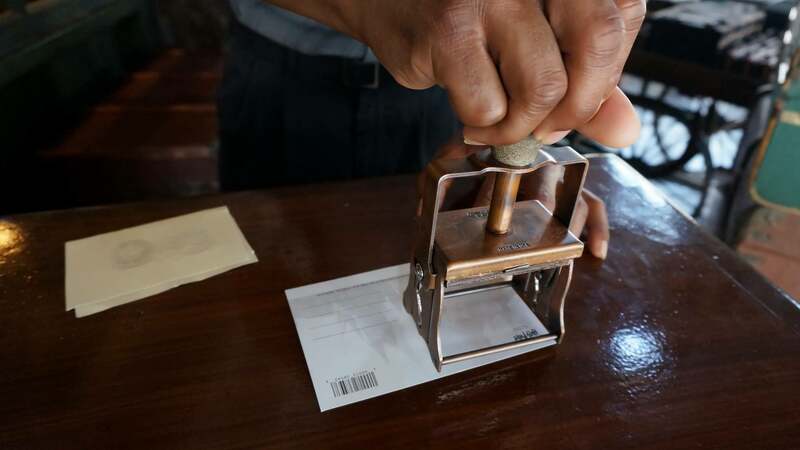 In an effort to help you kick off your spending, we’ve compiled a short list of what we feel are the best items in terms of their novelty, collectibility, and value for first-time visitors. 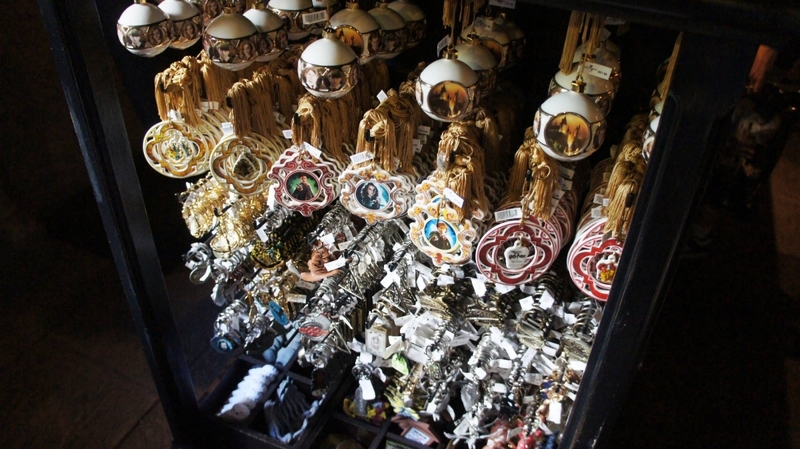 We spent around $213 on souvenirs. The kids both received $50 gift cards for Easter, so they bought some of the above with them. 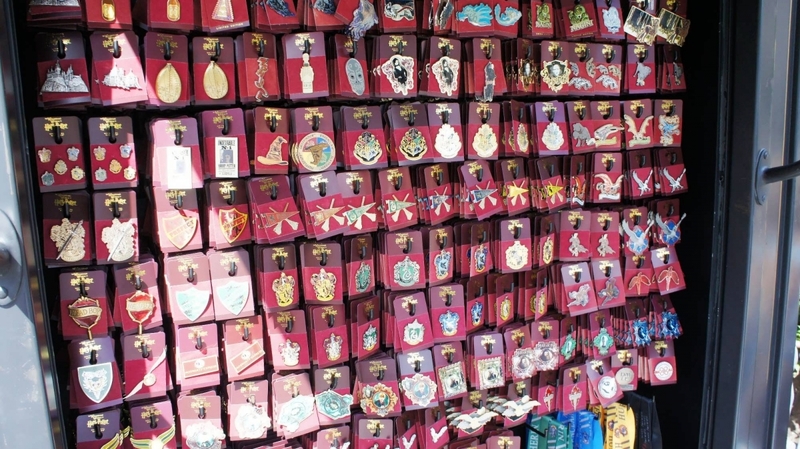 I didn’t have a hard and fast number, but we stressed only picking a few things and bought on the last day so we had a chance to see what all was available. 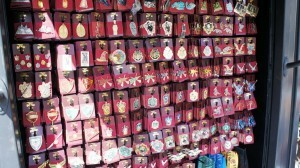 We also bought a few gifts for those at home, but I’m not including those. 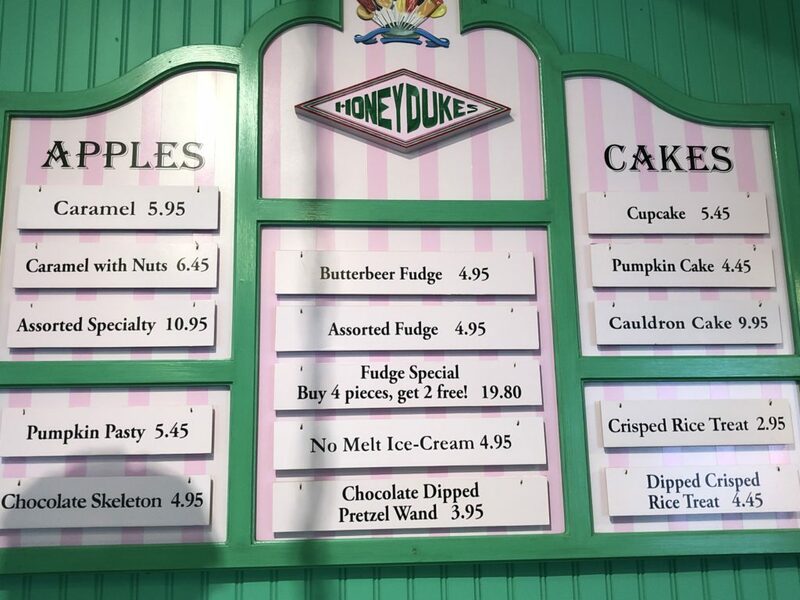 I feel we got our money’s worth from the Butterbeer mugs. 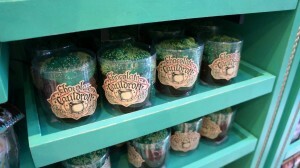 We bought those early on the first day and used them as our refill mugs for all three-and-a-half days. 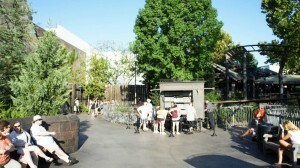 We drank a lot of free water from them! 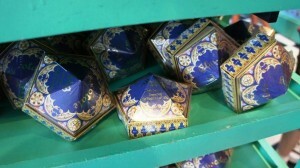 We were really the only people I saw using them outside of Hogsmeade, although I’m not sure why. We clipped them on a carabiner that was attached to the backpack. 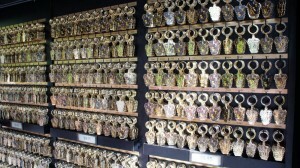 It worked well for us. 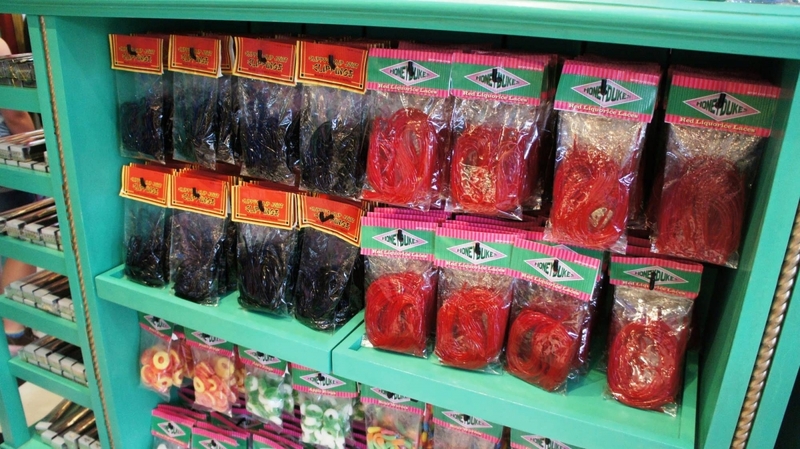 The most important thing you need to know about shopping inside The Wizarding World of Harry Potter is that the shops are small in every sense of the word. 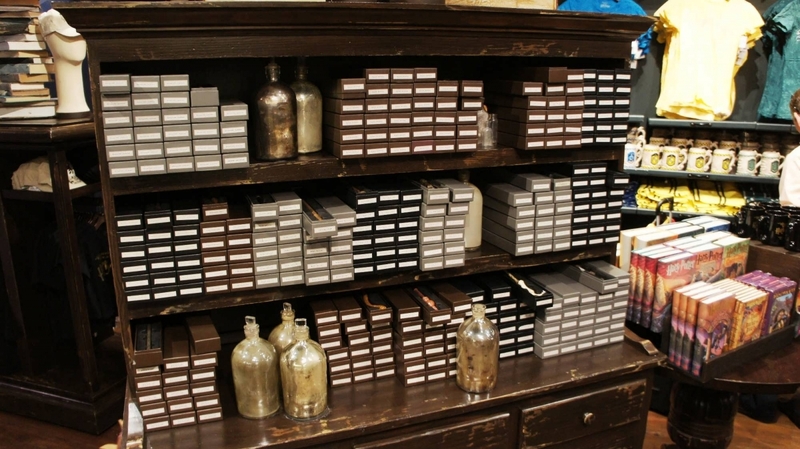 The purpose of their intimate size is to reflect their “boutique” nature and stay true to the stories you’ve read. 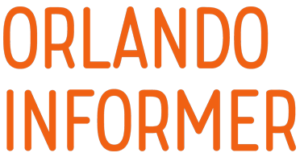 While this sounds great on paper, we’re sorry to say that it can be extremely uncomfortable in practice, particularly for guests requiring special assistance. 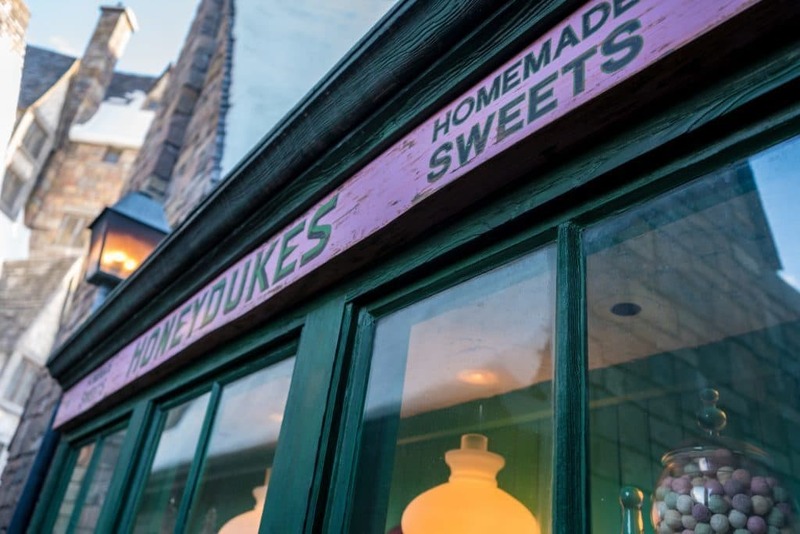 It literally takes no more than a dozen people to fill up any one of these shops, and with thousands of Potter fans visiting the area each day – well, you can do the math. That’s why, if browsing through the merchandise inside Hogsmeade and Diagon Alley is something you’re greatly looking forward to, it’s absolutely essential that you read our how to ensure your trip to the Wizarding World is a success! page. 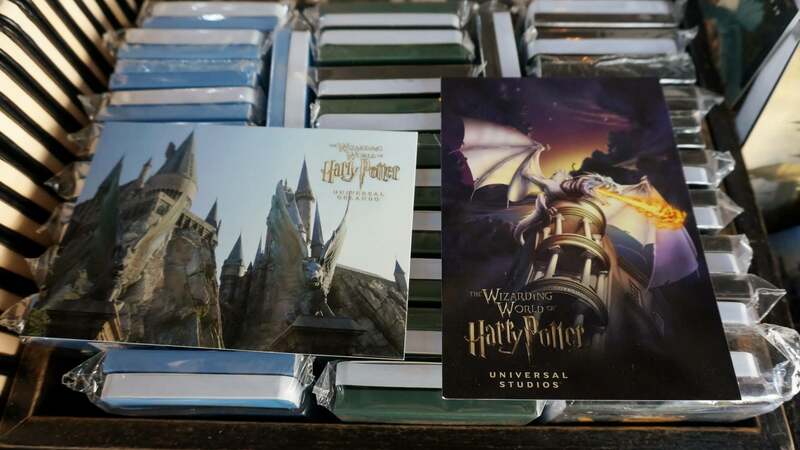 If you do find that the shops inside Diagon Alley and Hogsmeade are simply too packed for you to navigate them comfortably, remember that you can buy Wizarding World merchandise at the front-entrance gift shops and at the Universal Studios Store in CityWalk. 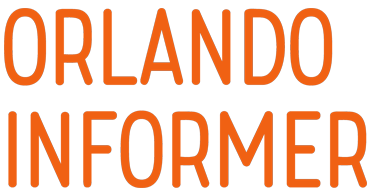 In addition, you can purchase select items in the Universal stores at the on-site hotels and at the Orlando International Airport. 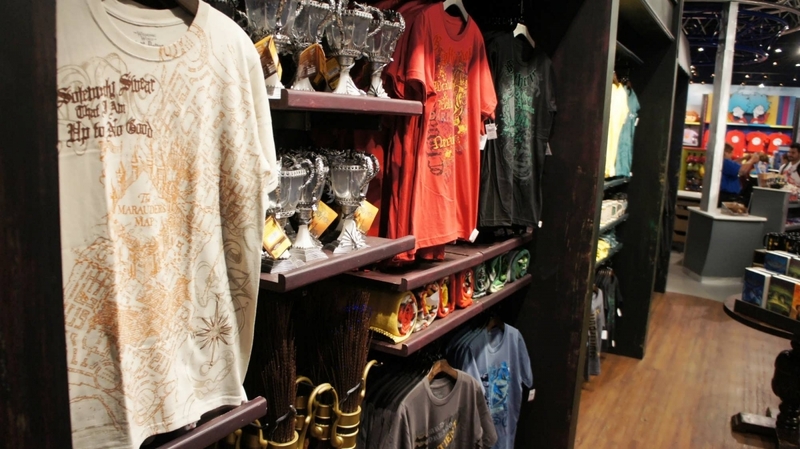 Last but not least, a decent selection is also available for purchase from Universal’s official online merchandise store. 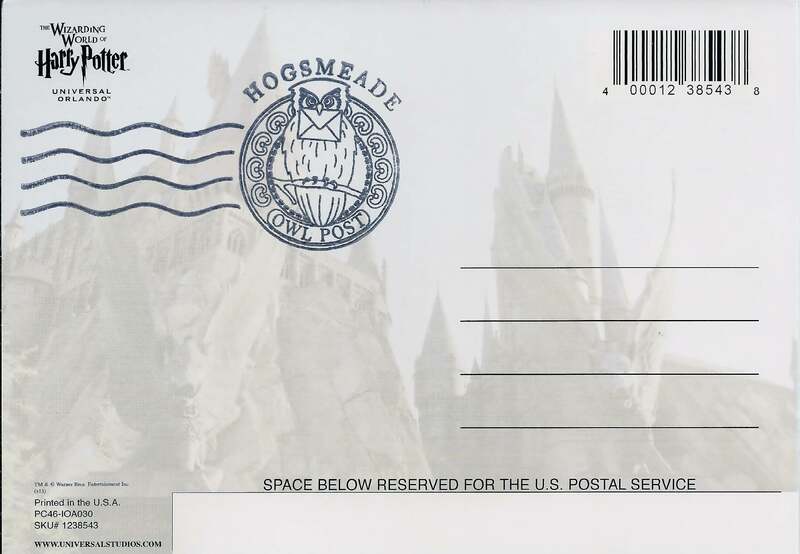 Thanks for reading our page covering The Wizarding World of Harry Potter – Hogsmeade’s merchandise. 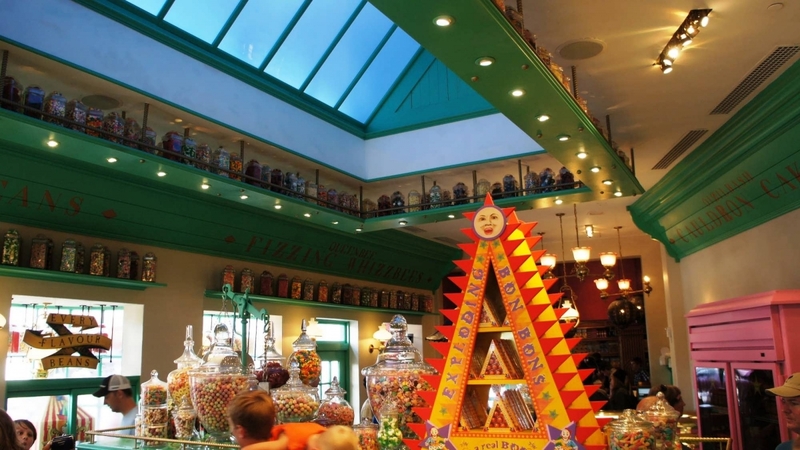 We also have a page dedicated to the Diagon Alley merchandise, and if you’d like to learn even more, be sure to check out our general Shopping and merchandise at Universal Orlando page for more information and tips on how to save money.